Discover prized Wagyu beef steaks otherwise unavailable for purchase in Australia due to overseas demand. Enjoy stunning panoramic views across the rugged and beautiful Canunda National Park. Experience Yalumba's finest wine - The Caley Coonawarra & Barossa Cabernet Shiraz, while staying at The Yalumba Menzies Retreat, a luxury boutique apartment in the heart of Coonawarra. Enjoy a memorable chauffeur-driven tour of the Coonawarra Cabernet Sauvignon cellar door icons and explore one of South Australia's most impressive caves at the Tantanoola Caves Conservation Park. Airport and all connections in private accredited chauffeured vehicle (RRP $95). Your 4 course dining experience at Mayura Station's famous specialist wagyu beef restaurant, The Tasting Room, will impress. While you are seated at the Chef’s table Mayura's in-house chef Mark Wright will prepare your dishes in a unique interactive format providing a first class experience including the history of Wagyu, the benefits of dry-hanging as well as how to prepare, cook and savour Mayura's full-blood Wagyu Beef. 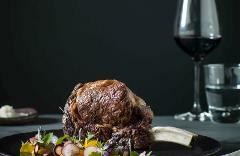 Mayura Station is an award-winning beef producer with one of Australia's largest full-blood Wagyu herds. Wagyu is said to be the world's best beef, and Mayura Station has been named as one of the world's best producers. 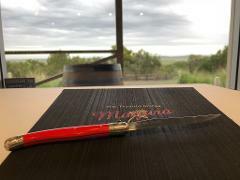 The Tasting Room is set on a farm overlooking paddocks of grazing cattle with distant views of Canunda National Park and the sand dunes of the Limestone Coast and is South Australia’s best steak restaurant. Due to high export demands for Mayura's product, many of the cuts of Mayura's Wagyu Beef served during your dining experience are not available for purchase in Australia providing an added incentive to visit and sample these prized steaks. The Tasting Room is fully licenced and wines are chosen from The Limestone Coast Region, including the acclaimed Coonawarra, to match the menu being served. This package includes an exclusive offer from Mayura Station - every guest receives a Mayura Station steak knife engraved with the guest’s name that can be taken away or left on display in the wall-mounted knife displays that immortalize the restaurant’s high-flying guests. In addition, every guest will take away 100gms of otherwise unobtainable pure blood wagyu steak (vacuum sealed). This stunning contemporary accommodation is named in homage to Yalumba’s top-shelf Cabernet Sauvignon “The Menzies”, a bottle of which is included in the accomodation package. The moment you enter the dramatic open-plan living area, you know these digs are a fitting tribute to a great wine - even the decor is accented in rich red shades. Sleek timber floors, rammed-earth walls and a vaulted ceiling with exposed beams also set the tone, along with picture-window views of honoured vines and eucalyptus. As well as two suave bedrooms, there's the latest in designer kitchen and bathroom facilities. Panoramic views of the surrounding native re-vegetation area and Yalumba Menzies vineyard, this B&B is ideally situated only minutes away from other award winning wineries, restaurants and other tourism attractions of the Limestone Coast region. This package includes the Deluxe Upgrade which adds for each person for each night of the stay: 2 eggs, 1 piece smokey local bacon, 1 croissant, 2 tomatoes, 2 mushrooms, crusty sourdough loaf, 500ml fruit juice, 500ml milk, Bircher muesli, jams, spreads, butter, margarine, quality tea and coffee, and fruit plus one 750ml bottle of “The Menzies” Coonawarra Cabernet Sauvignon. Fred Caley Smith, grandson of Yalumba founder Samuel Smith, was a horticulturist who had a profound impact on the development of Yalumba’s vineyards. In the early 1890’s he spent 18 months trekking across the USA, Britain, Europe, the Middle East, India and Sri Lanka, observing and reporting on scientific and horticultural developments. His detailed letters, sent home every few days, underpinned the way our vineyards were managed, and laid the foundations of sustainable viticulture at Yalumba today. The Caley is the pinnacle of a long winemaking journey of excellence, that rightfully honours one of Yalumba’s most adventurous sons. A blend of Coonawarra Cabernet Sauvignon and Barossa Shiraz, The Caley is a classic marriage of two noble varieties and two great Australian wine regions. Your journey begins at 10.00am at Parker Estate and traces the Coonawarra legend to Balnaves (10.45am). Then we visit Penley Estate (11.30am) and finish at the magnificent Rymills where a platter is laid out at 12.15pm, after which we begin the voyage to Tantanoola. This spectacular cave, set into a cliff face, is believed to have been exposed by the constant pounding of the ocean. Over time the sea has retreated leaving behind a cavern of interesting shells, pebbles, bones and an extraordinary display of cave decorations (speleothems) in beautiful shades of pink and brown, coloured by its dolomite base rock. This tour includes a spectacular guided cliff walk. 2.15 - 4.30pm. Arrive anytime up until 11.00pm (to give you time to get to Penola from either Adelaide or Melbourne after work by car or to be collected from either Coonawarra Airstrip or Mt Gambier airport) and check into Yalumba’s Menzies Retreat with your private SMS code. Enjoy a generous farm breakfast and wander amongst the vines outside your door. We collect you at 10.00am and begin your Cabernet Icons wine tour. We will feed you some gorgeous cheeses and cured meats along the way. At 1.15pm we begin the journey to Tantanoola to explore the glorious dolomite cave and cliff views to work up your appetite for your fabulous wagyu beef dinner at Mayura Station in nearby Millicent beginning at 5pm. After that it’s just one place you will want to be – back to the Menzies Retreat! After a suitably urbane late check out of 11.00am, and after finishing the last of your breakfast provisions, the day is yours to enjoy in Penola, Robe, Naracoorte or Mt Gambier. 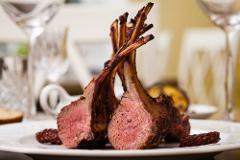 This two night experience introduces you to the world of lamb – in person and as a dining adventure. 1800’s cottage (4 to choose from) with your private SMS code. It will already be warm and snug and the smell of homemade bread will greet you at the door. Inclusions: 2 nights accommodation at Historic Cottage (4 to choose from), breakfast provisions for two mornings, ”Best wine to go with lamb” wine tour, 3 course lamb dinner at Upstairs at Hollicks, full shuttle service. With a focus on Chinese visitors, this package includes a home prepared Sichuan hot pot meat and plenty of winery tastings. 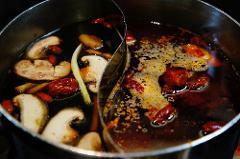 With a focus on Chinese visitors, this package includes a wine tour favouring Chinese preferred winery styles with a Chinese/Australian tour guide, a traditional home cooked Sichuan Hot Pot (四川火锅), photo opportunities in the vineyards and the opportunity to taste dozens of commercial wines out of the tank and available for bulk sale. Maybe you will discover an export winner! Inclusions: 2 nights accommodation at Coonawarra Cabins, Chinese or western breakfast provisions, Chinese-guided full day winery tour, Sichuan Hot Pot Dinner, full-time Chinese guide, full shuttle service. Arrive anytime up until 11.00pm and check into Coonawarra Cabins, a new development of 4 self-contained apartments located beside a vineyard in Coonawarra where you are greeted by your local guide. A large kitchen is available for dinner (help yourself) or you can take a walk in the private 200acre bushland to view kangaroos and emus. Your day begins after a self-cooked farm breakfast with a VIP tour of the Naracoorte Caves. Enjoy a picnic lunch at Bool Lagoon or if it is wet came back to the cabins for an undercover feast. Gather your energy because its time to explore the Comaum State Forest where we will hunt yabbies and pick mushrooms. Dinner is a meat stravaganza smoke-cooked in the webber. After dinner you are invited to use the telescope to view the stars of the Southern hemisphere, crystal clear in the crisp air of Coonawarra. After breakfast you are free to explore Penola, Robe, Naracoorte or Mt Gambier. Inclusions: 2 nights accommodation at Coonawarra Cabins, farm breakfast provisions, guided ½ day Naracoorte Caves tour, ½ day Comaum bushwalk, Webber BBQ Dinner, full shuttle service. 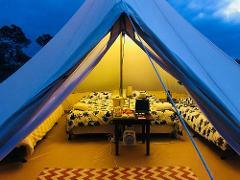 Have you ever tried glamping - that is, camping without the hassle, in your own tent under the stars? next morning or take our wonderful private bushwalking track. At 12.00 we shuttle you to Chardonnay Lodge for a matched cheeses and wine tasting. safely. Walking distance - 2km. Cook a BBQ in the camp kitchen or treat yourself to a dinner at Pipers or Hollicks. Relax afterwards in front of your fire with a glass of fabulous red wine, then settle in for your last night in the yurt – now you can tick glamping off your bucket list! to your fine dining experience at Upstairs at Hollicks. When you are ready we will shuttle you back to your warm cottage to enjoy your last night in Penola. After a sensibly late check out of 11.00am and after breakfast the day is yours to enjoy in Penola, Robe, Naracoorte or Mt Gambier. retreat to enjoy your last night in Coonawarra. After a sensibly late check out of 11.00am and after breakfast the day is yours to enjoy in Penola, Robe, Naracoorte or Mt Gambier. Coonawarra’s best accommodation and cellar doors, Yalumba’s finest wine and South Australia’s greatest steak restaurant combined in one package! Yalumba Family Vignerons and Mayura Station join Coonawarra Discovery to offer a ‘best of the best’ Limestone Coast experience. $1,699 pp 4 days, 3 nights accommodation (5 star), all meals, two wine tours, all connections and restaurant shuttles, daily housekeeping. Discover prized Wagyu beef steaks otherwise unavailable for purchase in Australia due to overseas demand. Enjoy stunning panoramic views across the rugged and beautiful Canunda National Park. Experience Yalumba's finest wine - The Caley Coonawarra & Barossa Cabernet Shiraz, while staying at The Yalumba Menzies Retreat, a luxury boutique apartment in the heart of Coonawarra, including the deluxe breakfast upgrade. Enjoy 2 memorable chauffeur-driven tours of the Coonawarra cellar door icons. Experience the fine dining offerings of Pipers of Penola and The Barn Steakhouse, Upstairs at Hollick and Fodder of Coonawarra. Nothing is left to chance on this hand-crafted, personally guided package. Airport and all connections in private accredited chauffeured vehicle (RRP $295). At 10 minutes to 10am we arrive at your accommodation. You climb into the nice new Hyundai iMax and its off to our first winery – the impressive Parker Estate. Enjoy the architecture and the spaces, the cheese and nibbles and most importantly, the wine. See an 18 litre melchior and admire the current art collection – it is always changing. At 10.45am your guide returns to deliver you to the Yalumba Menzies Wine Room for a private tasting and chat with James Freckleton, Yalumba’s Coonawarra Viticulturist. Here you will see the top-rate presentations on many aspects of Coonawarra while trying some of Yalumba’s finest wines with Coonawarra heritage. After you are satiated at Yalumba Menzies, your guide takes you to Highbank, a boutique winery on only 4 hectares of vines but with some beautiful views and superb hand-built buildings that are available for bookings should you require. After a comfortable chat with Denis Vice of Highbank, you are delivered at 12.15pm to Wynns, the pillar of Coonawarra winemaking and really a “must-see”. You can check out the wonderfully gnarled old vines – the oldest in the region, the fascinating museum displays or just head straight to the wine tasting on offer. You may also enjoy an optional cheese platter. After the morning’s activities you may be feeling a bit peckish and so you are now presented with your lunch options – great pizzas at Fodder, a 2 course set menu at Chardonnay Lodge, a 3 course set menu feast at Upstairs at Hollicks or a generous cheese and meat platter in Eric Brand’s Private cellar. On this occasion you Hollicks. All of your lunch venue options also provide wine tastings in you wish to combine your visit. After lunch you are driven up to the north of Coonawarra to view the magnificent Rymills winery and try their range of award-winning wines. Now it is time for one of Penola’s younger heros – Majella, and if you have kept to the schedule (no problems if not) we land at our final destination – the tranquil Balnaves besides the lake. It is now 5.00pm and you are totally ready to return to your apartment (also arranged by us for you) – which we immediately do. All you have left to do today is write us a five-star review and get ready for dinner. At 10am we arrive for your second tour. Our first winery today will be Angus and Brian at Whistlepost Wines. Enjoy the authenticity, the cheese and nibbles and their unique wines.At 10.45am your delivers you to Patricks where you may get to try the Grandfather Port made by Patrick T himself. After this it on to Leconfield we go, another award winning winery. After an interesting discussion with Paul Gordon, leconfield's winemaker, we dive on great sparkling wines and platters at Di Giorgio's Family Wines. The its time for lunch and again you are presented with your lunch options – today we choose a generous cheese and meat platter in Eric Brand’s Private cellar. After lunch you are driven a bit North to visit the pioneering Redmans, and then it’s time to try a chocolate and wine pairing at Penley Estate, one of our favourites. Now it is time for one of Penola’s smaller producer's – Blok Estate, and if you have kept to the schedule (no problems if not) we arrive at a new but progressive brand in Raidis Estate. It is now 5.00pm and you are keen to return to your apartment to freshen up for a great dinner! Day one (Thursday, Friday or Saturday) – arrival before 4.30pm (can include collection from either Coonawarra Airstrip or Mt Gambier airport) – You go straight to Yalumba Menzies Retreat, which will be provisioned for deluxe breakfasts for all guests, and check in with your private SMS code. At 5.00pm we collect your group and drive you to Mayura Station Tasting Room for a 6.00pm start to your fabulous 4 course wagyu beef dinner at Mayura Station in nearby Millicent including an exclusive matched selection of Yalumba wines. We bring you back to Yalumba Menzies when requested. Day two – Enjoy a generous farm breakfast and wander amongst the vines outside your door. We collect you at 10.00am and begin your full day wine tour (7-8 cellar doors) with lunch provided at Hollicks or Fodder/Otelia and various platters throughout the day. Menzies Retreat daily housekeeping in morning. 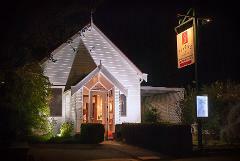 Dinner at Pipers of Penola at 6.30pm where you select your own wines. We bring you back to Yalumba Menzies when requested. Day three – Enjoy another big breakfast and prepare for your second full day Wine tour (7-8 cellar doors) with lunch provided in Eric Brand’s old cellar at Brand’s Laira, various platters throughout the day and finishing with matched chocolates and wines at Penley Estate. Menzies Retreat daily housekeeping in morning. 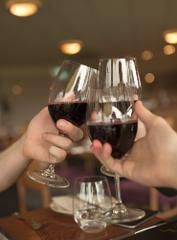 Tonight we drive you to dinner at the Barn Steakhouse, Mount Gambier, 6.30-7.00pm where you select your own wines. We bring you back to Yalumba Menzies when requested. 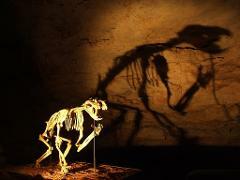 Day four – Late checkout 11.00pm if required - enjoy the Naracoorte Caves or explore Mt Gambier. Just as easy is a trip to the coast at Robe. The day is yours.